With snow in the forecast for the next several days, you would assume I was thinking of winter. Ah, but in a painting, I can immerse myself in the season of my choosing. 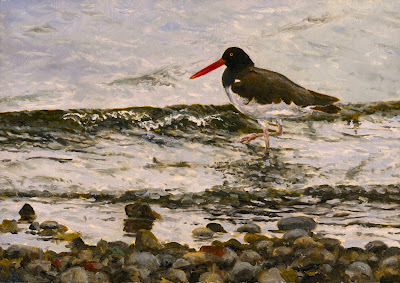 For this piece, I wanted to play with an oystercatcher I watched this summer on a Martha's Vineyard shore. It was an overcast day and I loved how his bill added spice to the scene.